With the party season fast approaching, get into the festive spirit with some delicious Cointreau inspired cocktails. As the iconic French spirit, Cointreau has been representing style and glamour since 1849 and is a key ingredient in many classic cocktails. So whether you’re dancing the night away at a stylish Christmas party or lounging by the pool bar with friends, a Cointreau cocktail is the perfect accessory to ensure a sophisticated summer. Bluetongue announced today the new look of its Bluetongue Premium Lager and Bluetongue Premium Light products. With its modern fresh look, the redesign intends to firmly position Bluetongue Premium Lager and Bluetongue Premium Light within the premium domestic beer category. 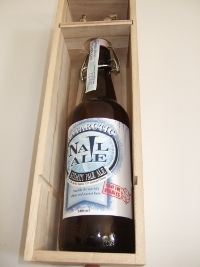 On November 3rd bottle number one (from 30) of the Antarctic Nail Ale from Nail Brewing in Perth sold at auction for $800. Taking the title of most expensive beer from Brewdog’s recently released limited edition “The End of History” ($765). The Antarctic Nail Ale has also stolen from Crown Ambassador Reserve ($90) the title of Australia’s most expensive beer. This unique beer was brewed in Western Australia with ice brought back from the Antarctic on the Sea Shepherds last campaign. All money raised from Antarctic Nail Ale will go to the Sea Shepherd to help fight the Japanese whaling in the Antarctic sanctuary. Everyone has at least one person in their life who is hard to buy gifts for, why not think Beer for this Christmas.Its refreshing on a hot Christmas, travels well and is easy to transport! Beer Cartel has recently put together some premium beer gift packs for that special beer lover in your life. An excellent gift for any beer enthusiast! The beers within this selection have been hand picked for their quality and variety – it’s definitely not the standard Heineken and Corona beer pack you’ll find at your local liquor store. 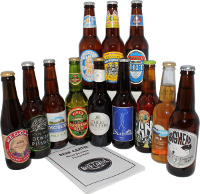 Each package includes 12 completely different beers from a mix of Australian and International breweries delivered to your door. Also included is a tasting booklet with information on each beer and a rating sheet to allow the lucky recipient to become a real beer connoisseur! Perfect for the beer die hard in your life, the Beer Cartel beer club membership is the gift that keeps on giving! Each month the recipient will receive 12 premium craft beers (3 beers each from 4 breweries) delivered straight to their door. Beer styles vary, guaranteeing something new to experience each month, from amazing Porters to sensational Ales. Tasting notes are included allowing the lucky beneficiary to learn about these hard to find beers from Australia and around the world. A sensational gift for those that think they have tasted everything! Skinny Blonde is an all Australian, all natural, low carb beer brewed in Sydney with a world first label. The beer’s inception began when three friends; The Vines drummer Hamish Rosser, winemaker Richie Harkman and artist Jarrod Taylor built a pilot brewery in Jarrod’s laundry and then, inspired by premium Japanese beers, set to work on a crisp, dry, easy drinking beer for all occasions. Using cheeky branding in the form of ‘Daisy’, a 1950s pin up girl, the beer is beginning to create quite a stir. The bottle utilises modern ink technology, which has allowed the brewers to achieve a world first – having Daisy’s bikini “disappear” as the beer is savoured. Enjoy and watch the difference! For more details or to purchase any of the gift packs visit the Beer Cartel website.